Could missing Madeleine McCann still be alive, British authorities say she just might. Madeleine McCann disappeared five years ago while on a family vacation in Portugal. Detective Chief Inspector Andy Redwood said he is leading a team of more than 30 police officers focusing on the case; however, he said police also have to consider that she may be dead. British girl Madeleine McCann, who went missing on a family vacation in Portugal, may still be alive, British authorities said Wednesday. 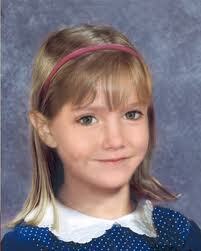 London’s Metropolitan Police plan to release a new image of the girl, who vanished in May 2007. Madeleine was nearly 4 years old when she vanished from her family’s holiday apartment in Praia da Luz as her parents dined in a nearby tapas restaurant with friends. See the timeline of Madeleine McCann’s disappearance. Please find her. The world needs a happy ending. To see this family whole again would restore faith. The McCann family is in my thoughts and prayers. Hope for the best news as soon as we can hear it. Wishing this family can be whole again. One need only to sit down with Kate & Gerry and have a nice long chat to find out where Maddy is, I think. This is not a very popular viewpoint. Kate & Gerry are a power couple. Professional, rich, attractive and socially connected. If this were not so — they’d be sitting in jail. Carpe, What a dreadful assumption to make. As a parent I would say that each and every one of us can remember a time of indiscretion, perhaps an unguarded moment, when such a disaster could have befallen us. Pray that Maddie will soon be home.